A lasting tribute to the Stolen Generations launched in Fitzroy on Sorry Day | Daily Review: Film, stage and music reviews, interviews and more. A striking work by Reko Rennie to commemorate the great injustice done to the Stolen Generations has been unveiled in a serene patch of parkland in Atherton Gardens public housing estate, in inner-city Melbourne. The aptly named Remember Me comprises a number of bronze spears and a coolamon – a bark vessel traditionally used to carry babies – with accompanying seating, lighting and landscaping. It was revealed to the public at the weekend during a poignant ceremony in Fitzroy to mark national Sorry Day – held on May 26 each year to recognise and remember members of the Stolen Generations and their families. For Reko Rennie, a Kamilaroi/Gamilaroi man, making the work had an inevitable personal dimension. His grandmother, Juila, was stolen at the age of eight from her home in northern New South Wales, placed in various missions and forced into years of domestic servitude. “Nan didn’t talk about these things because it was so traumatic, but as she got older those things came out and we found them out as a family,” he said. The location for the work, on Wurundjeri land – abutting the now gentrified Fitzroy’s Gertrude Street shopping strip – has deep historical resonance. From the 1920s, the suburb of Fitzroy was known as the urban heart of Aboriginal Victoria and gave birth to a number of key Aboriginal advocacy organisations. The gardens themselves were a gathering place for Aboriginal people who came to find and reconnect with their families. 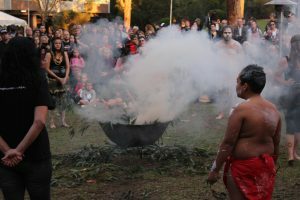 Ian Hamm, a Yorta Yorta man and CEO of the Victorian Aboriginal Community Controlled Health Organisation, said the marker’s true value would be felt long after an official launch. Referring his own removal from his home in Fitzroy, and the lasting impact of that act on his life, he noted the marker’s “real importance will be tomorrow”. The public artwork is the result of a collaboration between the City of Yarra and the Victorian Government with input from local Indigenous peoples and community groups including the national anti-poverty group the Brotherhood of St Laurence.